Parmesan.com is the name of a brand new website launched this week by the Consorzio del Formaggio Parmigiano-Reggiano. Visitors to the site will find a blog, extensive information about The King of Cheeses including its health benefits and illustrious history, great photos, and even interactive games and videos. Best of all, for those who just enjoy eating Parmesan, there is a wealth of recipes supplied and shared by both featured chefs and home cooks. 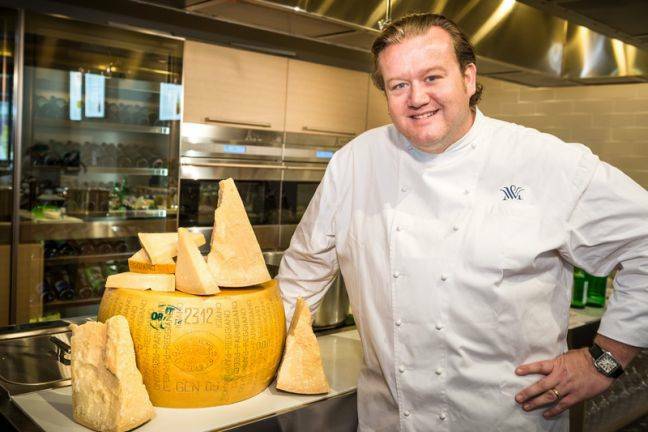 To celebrate Parmesan.com, Chef Michael White demonstrated a few of his favorite Parmesan recipes at the new Scuola Grande at Eataly. Chef White is the owner of numerous restaurants, including Marea, Osteria Morini, and the soon to open pizzeria, Nicoletta. His first recipe was Ricotta and Asparagus Tortelli with a Fonduta of Parmigiano Reggiano. The chef demonstrated how to make the luscious filling, generously laced with freshly grated Parmigiano Reggiano and nutmeg, and fold it into perfect little fresh pasta envelopes. The creamy cheese sauce and lightly cooked asparagus with fava beans and leeks made this the perfect pasta for spring. Chef White, who lived and worked for many years in Emilia Romagna, where Parmigiano Reggiano is made, said that the cheese is in the "top 5 most important ingredients" in his kitchen and he uses it every day. The next dish he prepared was Chicken Petroniana, a classic recipe from Bologna. He began by dipping chicken cutlets in grated Parmesan, then in egg and breadcrumbs before frying them. He offered a great tip: putting the grated cheese on the meat before adding the egg and breadcrumbs insulates it from the heat so that it won't burn when fried. The crisped cutlets were topped with prosciutto and thin shavings of Parmesan which wilted from the heat, and a creamy cheese sauce. Even the dessert was made with Parmigiano-Reggiano. Chef White introduced his pastry chef who prepared a White Chocolate Parmigiano-Reggiano Semifreddo with Balsamic Glazed Strawberries and Candied Hazelnuts. It was made by infusing milk and cream with the scraped Parmesan rinds. The chef said that the nutty and fruity flavor elements of Parmigiano-Reggiano made it a natural for using in desserts. Nancy Radke, director of the US Information Office for Parmigiano-Reggiano said that the Consorzio has a renewed commitment to engaging with and educating the public through social media. For example, in April, Parmigiano-Reggiano joined Facebook and nearly 17,000 people joined their fan page. Their Twitter handle is #OnlyParmesan. Parmigiano-Reggiano is a handmade cheese and is completely free of additives and preservatives. Made from partially skimmed milk, it is aged an average of 24 months. I always keep a big chunk in the refrigerator since Parmigiano Reggiano makes a perfect snack, simple dessert with fresh or dried fruit and nuts, and is an essential ingredient in many Italian dishes. You can find Chef Michael White's recipes mentioned above and many others at www.Parmesan.com.